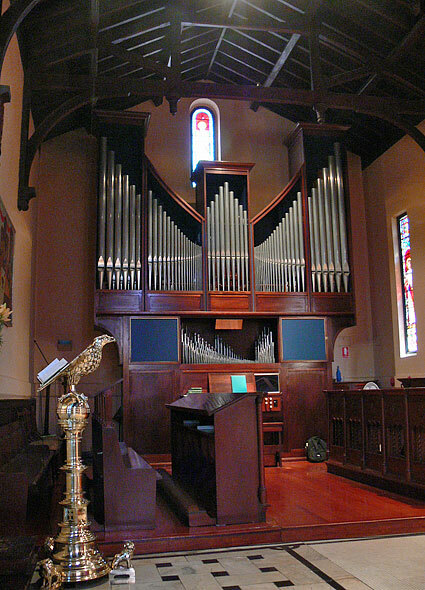 The first organ at Christ Church was built by Alfred Fuller and opened on 24 November 1889. 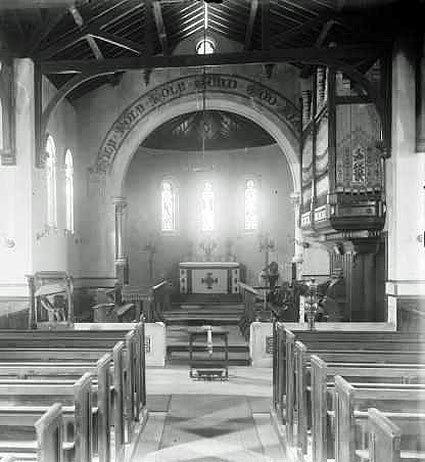 It was initially sited on the right wall of the chancel where space was extremely constricted and it was moved to the right transept in 1898. The façade pipes (including the wooden pedal pipes at the end of the case) were elaborately stencilled. It was rebuilt in 1934 by Hill, Norman & Beard (Australia) Pty Ltd (order number V25) who converted the original mechanical action to tubular-pneumatic with an attached stopkey console. At this time the façade pipes were covered in gold paint. It was removed in 1972 and the parts dispersed. The specification of the organ was drawn up by the organist at the time, Edward King with the advice of Sergio de Pieri. The organ was built largely through the generosity of Mrs. Isobel Finchett, in memory of her late husband Albert Leslie Finchett, and by gifts, large and small from the congregation and the public. The Cymbel pipes are the gift of John Larter, in memory of his late wife Eileen Larter. The reed stops were the gift of the organist, Edward King. The consultant to the Committee was Sergio de Pieri. The project commenced in April 1967, and came to fruition in April 1972. Pressures: Great 60 mm, Positive 50 mm. Builder: Roger H. Pogson Pty. Ltd., Sydney. Date of Opus: 1971.